ATM Anthony Thomas Melillo cami in leopard-print silk charmeuse. Johnny Was "Rosalina" silk georgette top in patterned-print. Scoop neckline. Short sleeves. Relaxed fit. Side slits. Scallop hem. Pullover style. Johnny Was "Rosalina" silk georgette top in patterned-print. Scoop neckline. Short sleeves. Relaxed fit. Side slits. Scallop hem. Pullover style. Silk. Hand wash. Imported. Please note: This merchandise may have a distressed effect. It is a unique feature that enhances the product and is not considered a defect. 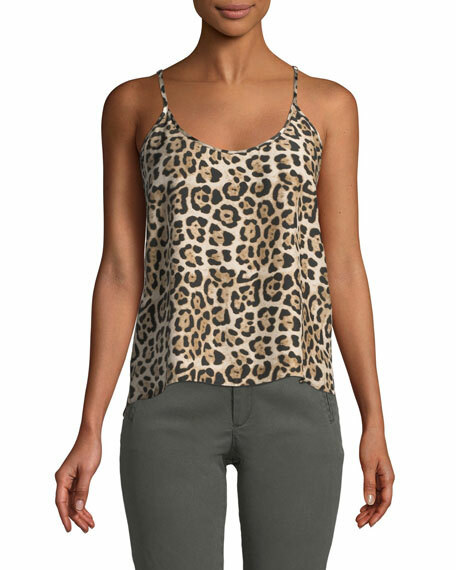 L'Agence "Jane" silk camisole with jewelry chain print. Approx. 18.8"L from shoulder to hem. V neckline. Adjustable spaghetti straps. Slim silhouette. Vented hem. Slipover style. Straight hem. Imported.